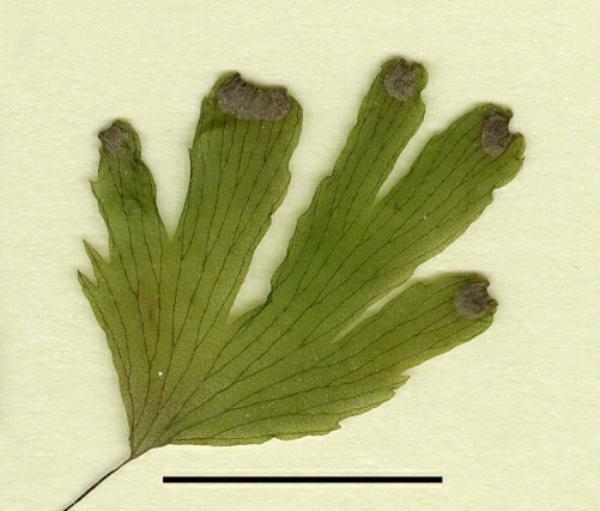 Adiantum membranifolium S.Linds. & Suksathan, Thai Forest Bull., Bot. 38: 67. 2010. – Type: Thailand, Chiang Mai, Fang District, Doi Ang Khang. Limestone cliffs not far from Royal Project, 1360 m alt., 1 Oct. 2009, D.J. Middleton, S. Lindsay & P. Suksathan 5031 (holotype QBG; isotypes BCU, BKF, E). Rhizome long creeping, branching, c.0.7(–1) mm diameter, densely covered with scales; scales narrowly triangular, entire, stiff, dark brown to black, shiny, not obviously clathrate, with a sharply pointed and sometimes crooked terminal cell, this sometimes missing in older scales leaving a notch in the cell(s) below, 0.8­­–1.8 mm long, 0.15–0.27 mm wide at base. Stipe 2.5–6.0(–12.5) cm long, 0.1(–0.4) mm wide, dark brown, shiny, glabrous, sometimes with a few scales at very base. Fronds usually once-pinnate or reduced to a single pinna, very rarely (and barely) bipinnate as a result of a basal pinna having 2 or 3 small pinnules; fronds, including stipe, to 12(–21) cm long, to 3.5(–6.2) cm wide, more or less oblong in outline; rachis rarely straight, usually zigzagging between pinnae, dark brown, shiny, glabrous; pinnae numbering 1–6(–8), arranged alternately and widely spaced, more or less equal in size but terminal pinna up to two times larger; pinnae on stalks 1–8(–11) mm long, these the same colour as the stipe and rachis; pinnae flabellate in outline, base forming an angle of 45–80° (exceptionally 90–130°), whole pinna deeply cleft usually to more than half way and forming several long narrow lobes, these often irregularly dentate at apex and margins, especially when sterile, margins smoother when fertile; pinnae 1.0-3.5 cm long, 0.8-2.5(-3.5) cm wide, pale to mid-green, thin, translucent, glabrous above and beneath; veins conspicuous, dichotomous, free, reaching margin. Sori at apex of lobes, on inner face of reflexed marginal flaps (false indusia), indusia subquadrangular, ca. 1.0–1.5(–1.8) mm long, 0.5–2.0 mm wide, glabrous, 2–4(–6) per pinna and never more than one per lobe; sporangia glabrous; spores dark brown, trilete, tetrahedral globose . NORTHERN: Chiang Mai (Doi Chiang Dao, Doi Ang Khang), Chiang Rai (Mae Sai). On almost vertical karst limestone cliffs in shade with water seepage. At Doi Ang Khang on crumbly limestone with moss. Surrounding vegetation recorded as seasonal mixed evergreen and deciduous hardwood forest or orchard. Vulnerable VUD2. This species is only known from three very small populations, at least one of which is suffering from agricultural encroachment. Further research is necessary to clarify whether it may require a higher threat status.